Adolescence is a time when many girls begin to develop unhealthy behaviors that can affect myriad short- and long-term health outcomes across their lifespan.2There is evidence that smoking, physical activity, and diet are habituated during adolescence, and some physiologic processes of adolescence, such as peak bone mass development, have direct effects on future health.3-4 Establishing healthy practices, beliefs and knowledge among adolescent girls will decrease morbidity and mortality among adult women and potentially affect the health of men and children through women’s role as healthcare agents. This paper provides a brief review of lifestyle health behaviors among women and girls and argues for the importance of developing gender-specific health promotion programs. The paper focuses around three behaviors: substance use, diet and physical activity. We chose these behaviors because they are commonly targeted in school- and community-based programs and are most often implemented in the co-educational settings that de-emphasize gender. Many other health behaviors also affect morbidity and mortality, most notably those related to sexual behaviors as well as intentional and unintentional injury. Although some of our conclusions may be relevant to those behaviors as well, our primary focus is on the lifestyle behaviors described below. Nichols, T., and A. Birnbaum. "Why girls? 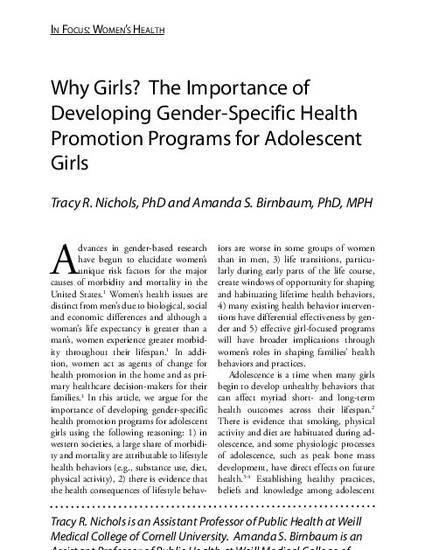 The importance of developing gender-specific health promotion programs for adolescent girls." Harvard Health Policy Rev 6, no. 1 (2005): 48-56.